July 13, 2016 – Portland, Ore. – Gentrification is the major talking point of the city today — but for many communities here, it has been a reality for far too long. Activist, Laquida Landford partnered with Community Cycling Center and Ignorant/Reflections to create a bike ride addressing the deep wounds communities of color have suffered due to gentrification, with an emphasis on healing. 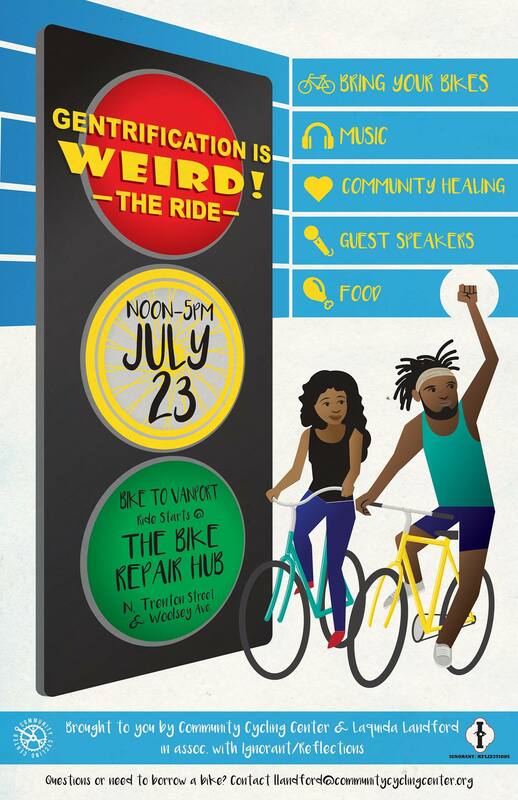 Borrowing its namesake from a popular design produced by local clothing line Ignorant/Reflections, “Gentrification is WEIRD!” The Ride, will include live performances, guest speakers, food, and informational booths from an array of community organizations. There will be live performances by Poetic Justice crew, poetry by Llondyn Elliott, and DJ Ryder will be spinning. Mayor-elect Ted Wheeler will attend the event and field questions from Donovan Smith, co-organizer of the event and owner of Ignorant/Reflections. Donovan calls the thread of history to present day conditions evidence of a renaissance in the city. The ride will begin at the Community Cycling Center’s Bike Repair Hub in New Columbia and will travel to Vanport, where community members will share stories, history, and healing. Where: Meet at the Bike Repair Hub, at N. Trenton Street and N. Woolsey Avenue across the street from the Regence Boys & Girls Club in New Columbia. The Community Cycling Center is a nonprofit organization founded in 1994 that helps people access their community by bicycle. We operate a full-service bike repair shop and partner with communities on neighborhood-based projects and programs. We believe that all Portlanders—regardless of income or background—should have the opportunity to experience the joy, freedom, and health benefits of bicycling. To learn more, visit www.CommunityCyclingCenter.org. Thank you to Metro for your generous sponsorship of Gentrification is WEIRD! The Ride.